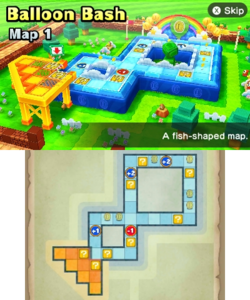 Map 1 is the first Balloon Bash board in Mario Party: Star Rush and the only map initially available at the start. In shape of a fish, it is the smallest and simplest out of the three maps. Players first start out on the orange "tail" of the fish, which contains ? Blocks and is on a raised platform, meaning players cannot go back to it once they have jumped down. Various balloons appear in some of the designated blank spots of the board, such as the upper right corner. Unlike the rest of the maps, this map lacks a Shy Guy Shop. When players have played and completed this map, they unlock Map 2. This page was last edited on October 10, 2017, at 23:56.